Pastor Charles holds a Masters Degree in theology and an S.T.B. degree from St. Mary’s Seminary and University as well as master’s credits in English Education. 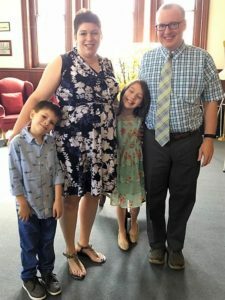 As a formerly state certified English teacher, he has taught High School in Montgomery County and Middle School in Catholic Schools and Baltimore City Public Schools. He also taught philosophy at Frederick Community College. Pastor Charles has a wife, Jaime, and a young son, Cullen, and daughter, Finnley. He loves the arts and music, especially playing his guitar. He is an avid reader who enjoys reading philosophy in his spare time. We have a very active group of volunteers that help keep things going.